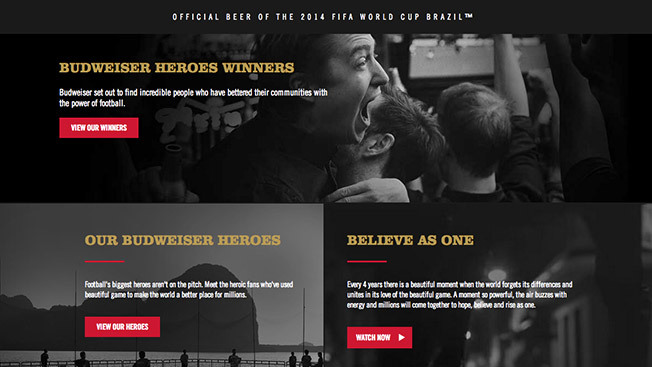 Anheuser-Busch’s Budweiser is giving digital a prime spot in its sponsorship as the official beer of the upcoming 2014 FIFA World Cup with a string of video and social efforts. "On top of TV and the more traditional [parts], digital is the lead component of this campaign," Ricardo Marques, Budweiser’s global advertising director, told Adweek. "One of the things that we wanted to ensure was that we understood the specifics of each platform and made sure that we have content tailored to each platform," he said. Budweiser has created a microsite for its "Rise as One" campaign that serves as a hub for all video and social content surrounding the week-long event. During the tournament, Budweiser will use Twitter Cards to let fans vote for their favorite players, called the FIFA Man of the Match. The beer brand will then award a player after every match and will buy Promoted Tweets to drive traffic to the content. Promoted Posts will also be used on Facebook that direct consumers to the campaign’s microsite to vote. As far as video, the campaign includes two Web series that Budweiser has created with Fox Sports and Vice. The Fox Sports content spans 80 countries for a global push, and the Vice video includes a six-part documentary series. The second phase of digital activations will kick off in June with the opening of the Budweiser Hotel within the Pestana Rio Atlântica hotel on Rio de Janeiro’s Copacabana Beach. An Instagram booth and Facebook studio will help Budweiser churn out social content that is taking place at the sponsored spot. The efforts build on a similar digital-heavy emphasis that was put on during the Super Bowl XLVIII in New York earlier this year. That activation for Bud Light Hotel included a mobile app that gave fans the chance to win tickets to the game. However, Marques said the Bud Light Hotel mobile effort rendered unclear data results, so his team chose not to employ an app for the Budweiser World Cup promotion. “We have decided to place more emphasis on platforms that are used more by our audience versus creating an app and then investing in a lot of resources,” Marques explained.